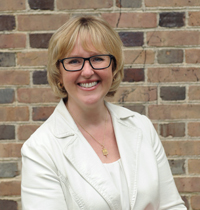 Ginger Ambler ’88, Ph.D. ’06, William & Mary’s vice president for student affairs, has been deeply involved with the campus community since her time as an undergraduate. Her connection to the university has helped her excel not only in her work with the Division of Student Affairs, but also in helping individual organizations reach their full potential. In recognition of Ambler’s exceptional commitment to fostering a rich environment for fraternity/sorority life at William & Mary, the Association of Fraternity/Sorority Advisors (AFA) has honored her with the 2015 Dr. Kent L. Gardner Award. The AFA will present Ambler the Gardner Award during the AFA annual meeting in Fort Worth, Texas, on Dec. 5. The AFA annually presents the Gardner Award to a senior college or university administrator who has demonstrated a long-term commitment to advancing fraternity and sorority life. Staff members across the campus and alumni nominated Ambler for the award and cited both her prominent visibility in advocating for fraternity and sorority life on campus, as well has her mentorship of future student affairs and higher education professionals, many of whom have gone on to advise fraternity and sorority communities in their nominations. This is not the first time that the AFA has recognized people at William & Mary for their work with the fraternity/sorority community. Last year, Anne Arseneau, William & Mary’s director of Student Leadership Development, received the AFA’s Robert H. Shaffer Award, in recognition of her long-term commitment to fraternities and sororities. In 2011, Leung served as the annual meeting chair for the AFA.